The thing he notices first is that the flames are green, as if the trees on the other side of the street had gone incandescent in the dark. Gandhi whimpers, his snout on the bed at Adam’s elbow; the cold touch of his nose is what woke him. The air is hard to breathe and full of sparks. A crash—Adam sits up in bed in time to see a huge branch float to the ground and a ball of flame arc across the street and set a tree on their side alight. He jumps up and curses the Arab who set the fire. 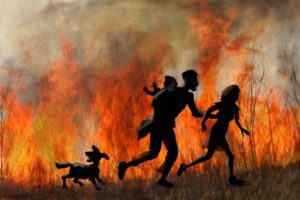 When they emerge from their front door, Yoel exults: “Firetruck!” They stand on a peninsula, an enclave of houses surrounded on three sides by flames. Five firemen in yellow suits are hosing the trees and gaping at them. Orit hugs Yoel close. “We were sleeping. No one woke us up.” The heat was almost unbearable but Adam could feel the cold of the November ground welling up through the soles of his sandals.